Have you noticed that the mosquitoes are being super aggressive lately? You are not alone, and you are not crazy! We have gotten a lot of calls in the last 4-5 days from our existing customers who say that they have seen a sudden surge in mosquito activity, and we are here to tell you that this won’t last for long. We have been able to identify the mosquito responsible for this unusual activity, a floodwater mosquito called Psorophora columbiae. Culex quinquefasciatus, the Southern House Mosquito, which is medium sized, brown, breeds in dirty water and tends to bite at night and indoors. This is the mosquito that carries West Nile Virus. Aedes aegypti, the Yellow Fever Mosquito, which is black with white stripes on the legs, breeds in standing water, and tends to bite during the day, especially in the morning or late afternoon. This is one of the mosquitoes that carries diseases such as Dengue Fever, Chikungunya and Zika. Aedes albopictus, the Asian Tiger Mosquito which is also black with white stripes, breeds in standing water and is active during the day. This mosquito also carries such diseases as Zika, Dengue Fever and Chikungunya. The other mosquito species in Texas that are bothersome to people are mostly what are called “Floodwater Mosquitoes,” which means that they lay their eggs in areas that occasionally flood. The eggs of some of these species can be completely dried out for several years! When the rain comes after a dry spell and they find themselves in a wet environment, the eggs progress quickly through their lifecycle and hatch as adults in about two weeks. They are highly aggressive and quickly lay more eggs in those same areas, and then die off in just a few weeks. Thankfully they are not good disease vectors because of this very short lifecycle. The floodwater mosquito that we are seeing a lot of now is called Psorophora columbiae, also known as the Dark Ricefield Mosquito. They travel up to five or 10 miles from their hatch site to find a blood meal, so you don’t necessarily have to live next to a field to see them. They are persistent biters that attack day and night and even in direct sunlight. They have dark and silver coloring and they do tend to bite when they are disturbed, which is why you may notice them coming out when you go to water the plants in your yard. The bad news is that these mosquitoes hatch in huge numbers, which makes them difficult to control. The good news is that the adult stage of their lifecycle is very short, so they won’t be with us for more than a few weeks. This is a mosquito origin story from Southeast Alaska. 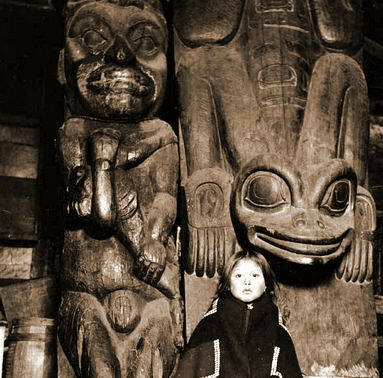 It is a Tlingit story from Klukwan, on the Chilkat River near Haines, Alaska. While Southeast Alaska is about as far from Central Texas as you can get, in so many ways, it provides a good explanation for the mosquito’s ever hungry nature. Many years ago on the mountain above Klukwan lived a giant. The giant would come down into the fish camp and steal the salmon from the drying racks. This angered the villagers, and made them thin and hungry. When the fish were gone the giant began hunting and killing the villagers for food. It killed and ate many people. They were afraid to leave their homes and fearful for their children. They tried to kill it with spears, but the spears just bounced off the giant’s thick skin. The villagers called a council to decide how to get rid of the giant. They tracked the giant up the mountain, and into the woods. Soon they saw a large community house with blood red smoke rising from the chimney. They knew this was the cannibal’s home. They decided to build a trap, like the hunters do for grizzly bears. They dug a deep pit, and lined the bottom with a tough sinew net. The hole was very deep, deeper than for a grizzly bear, and they covered it with branches and twigs to match the forest floor. Early in the morning, the villagers sent a fast and light hunter to the giant’s home, to draw the enemy out. The hunter, chased by the cannibal, ran lightly over the top of the trap. The heavy giant crashed through the poles and branches and snared himself in the net at the bottom. The villagers filled the pit with wood and soaked it with fish oil. When they brought the torches, the cannibal realized what they intended. He roared out that they did not have the power to kill him and even burned to ash he would feed on them. To stop the cannibal from keeping his promise, the villagers kept the fire burning for four days and four nights. On the fifth day, the fire had burned down to ashes. The villagers took a long pole and stirred the ashes to make sure nothing remained of the giant. As they stirred, ashes and sparks flew into the air, and changed into mosquitoes which dived at once, biting and feeding on the villagers’ blood. The cannibal giant’s promise was fulfilled, and he returns today to feed on the blood of people. Monarchs are one of America’s favorite butterflies, and one of the most interesting. Here in Central Texas we are gifted with both summer monarchs, and huge numbers migrating in the fall. These interesting insects are also the state insect of Texas. Migration is one of things that makes monarch butterflies so interesting. Most insects complete their life cycle very close to home, but monarchs are an exception. These butterflies migrate long distances to overwinter in Mexico and California. Monarchs, like other butterflies, go through four complete life stages; egg, larva, pupa and adult. Most butterflies overwinter in egg or pupa stages, but the monarch takes a different path. They complete three full life cycles during the summer months in North America, dying after they lay their eggs. Finally, they lay their eggs for a fourth time, emerge, pupate and become adults. These adults are the special ones that in September and October will make the long journey to Mexico, and overwinter in the adult stage. The migrating monarchs we see in the Austin area come from all over the central United States and Canada. In February and March, the monarchs end their hibernation, breed, and die. The newly hatched monarchs begin the journey north. taste to predators. Unlike some species of butterflies, monarchs are very picky about where they lay their eggs and live as caterpillars. Milkweed is the only plant where monarchs lay eggs and caterpillars feed. As they feed on milkweed, monarch caterpillars store up fat that is transferred to the pupa and adult stages. The chemicals in the milkweed sap are poisonous and taste nasty. Monarchs concentrate these chemicals in the fat as larvae making the monarch butterflies taste disagreeable to predators. The bright colors and pattern of the monarch signal to predators that they are not a tasty treat. Most predators only try a monarch once! Some other butterflies even imitate monarchs’ coloring to get the same predator protection. Adult monarchs feed on just about any nectar producing flower. To attract these butterflies to your yard, plant milkweed for a host plant, and flowers for the adults to feed on. We should be noticing many more monarchs in the coming weeks as they continue their migration to Mexico. By mid-October, in some Central Texas locations, we should be seeing hundreds a day. Keep your eyes out for these beautiful and unusual butterflies! April 25 is World Malaria Day. Malaria makes mosquitoes the most dangerous animal on the planet. Malaria, a mosquito borne illness, kills more people every year than all the wars combined. There are many organizations and groups that fight malaria. Mosquito Squad supports Malaria No More. Malaria is a mosquito borne illness that has been found worldwide, and it was endemic to the US as recently as the 1950s. Annually it kills about 600,000-700,000 people worldwide, and incapacitates another 200 million. Most of the people malaria kills are children. It causes billions of dollars of economic losses, millions of missed days of school, and is a leading cause of childhood death. A child dies from malaria every minute. This disease has literally changed history, from influencing Napoleon’s sale of Louisiana to delaying the building of the Panama canal. Malaria is carried by Anopheles mosquitoes. The disease doesn’t require an animal host. Mosquitoes transfer the disease directly from person to person. The disease itself is caused by the Plasmodium parasite. Once the infected mosquito bites a person, the parasite travels through the bloodstream to the liver where it reproduces. It is then released to the blood stream, where it continues to reproduce. The blood stage is where symptoms of the disease show, and where others can be infected by mosquito bites. The disease symptoms include fever, chills, nausea, body aches, general malaise. Severe malaria can include cerebral malaria, cardiovascular collapse, kidney failure, various blood issues and other symptoms. Malaria can result in death and chronic illness. The fight against malaria worldwide is a multi-pronged approach. It involves providing effective malarial treatments, preventative treatment, use of pesticide treated mosquito nets, mosquitoes elimination, and continued research. One dollar can buy effective mosquito treatment for a child, curing the disease in 1-3 days. Ten dollars is enough to buy a pesticide infused bed net. There are many organizations that work to fight malaria, and Mosquito Squad supports Malaria No More. Malaria No More (MNM) provides mosquito nets, fast diagnosis kits, malarial treatment and education. Every Mosquito Squad franchise, nationwide, donates to this cause. Find out more about malaria and the fight against it at World Malaria Day. It is well known that Austin is the Live Music Capital of the World. As locals, we can capitalize on that by enjoying all kinds of free concerts, plays and movies at venues across town. These fun warm-weather events start as early as March and go all summer long, featuring everything from well-known bands and theater companies, as well as small local groups. Some of the best known Austin events are KGSR’s Blues on the Green, KGSR’s Unplugged at the Grove, Shakespeare in the Park, and other events at the Zilker Hillside Theater. The KGSR music programs are always free and always well attended, so get there early. The same goes for the plays (this year they will be The Taming of the Shrew and Hairspray), get there early. I have been attending all of these events for years and I have never been disappointed. This is the good stuff, year after year, provided free to our community. In addition to these four biggies, there are numerous other music, movie and theatre options out there. They range from classical music and ballet to country music and movie sing-a-longs. Most area suburbs have music and movie programs, all are family friendly and free. This is by no means a comprehensive list. You can find more great events at Stuff to Do in Austin and Free Fun in Austin. This is an incredibly versatile salad that can fit any occasion. The flavors are fresh, and reflect what is available during the Texas summer season. Other great ingredients include snap peas, beans, zucchini or other summer squash, raw beets, bean sprouts, onions, kohlrabi, anise, celery, fresh corn and jicama. To make it a meal you can add chick peas, black beans or lentils. Any hearty bean will hold up well and make this salad a nice light summer dinner. To prepare, toss all ingredients together, refrigerate for about an hour before serving. Enjoy! Everyone knows that mosquitoes need water to hatch their eggs, and complete their life cycles, but not everyone is aware of the secret hiding places and breeding grounds they might have around their homes. Adult mosquitoes like moist, still, shaded areas and primarily feed on vegetation. Only the females need a blood meal to produce eggs. Most mosquitoes also have preferred times of day to feed, and rest during other times. Unfortunately for us, a well planted landscape, shaded patio or the underside of a deck provide excellent mosquito harborage. Vines, flowers, thick hedges and lush borders are a haven for mosquitoes. All the things that make our yards pleasant for us, also make them pleasant for mosquitoes. Homes can also harbor stealth breeding grounds for mosquitoes. Mosquitoes lay eggs in a variety of habitats, and some are unexpected. Very few mosquitoes lay eggs in running water, so a fountain or pond is rarely a mosquito source. Gutters, tires, toys, potted plants, tree holes, bird baths, air conditioner drips and rain barrels all can become mosquito larva factories. The southern house mosquito, Culex quinquefasciatus, prefers stagnant water with a lot of organic matter, such as storm drains, gutters and septic systems. The yellow fever mosquito and Asian tiger mosquito both prefer man made containers for laying eggs. Even a tablespoon of water (about the amount in a large bottle cap) can provide space for hundreds of larvae. Taking back your yard from mosquitoes begins with a few easy steps. To control mosquito breeding, regularly empty water from all temporary holding places. Replace water in bird baths, pet bowls, and wading pools at least every other day. Make sure rain water barrels are tightly covered and screened. If you are on a septic system and have large numbers of mosquitoes in your home, check the system. Make sure all roof vents are screened, screen septic tank vents and make sure septic tank lids are tightly fitting and closed. Add a larvacide or mosquito dunks to septic systems and rain barrels to ensure that adult mosquitoes do not develop. Maintain sprinkler systems and do not overwater. To prevent bites from adult mosquitoes, reduce harborage by keeping shrubs trimmed, and brush piles removed. Open areas of shrubs and vines to increase air flow. Install ceiling fans in covered patios, most mosquitoes don’t fly well in breezes greater than 10 mph. Avoid going outside during peak mosquito times. Wear light colored, loose fitting clothes, and use repellent. Treat lush, dense landscaping, hanging pots, and vines with a mosquito barrier spray. These areas are where mosquitoes hang out, and targeting them with an adulticide will go a long way in controlling mosquitoes.